The Mozaic board game is an abstract strategy game which will capture you with its unique game play: you can place, move, and discard your opponents pieces! To balance that, you can also score points for your opponent, so be careful! Mozaic is a very interactive game because you're always affecting each other's placement and score. Be prepared for 40 minutes of close-quarters battle as you try to outmanouver your opponent for the most points. The Mozaic board game has an interesting difference from most other abstract strategy games: you blind draw a stone from the pouch and you place it on the board regardless of whether it's your own stone or your opponent's. Players take turns drawing and laying stones on the board. A player scores when 4 of their stones makes a square, regardless of who layed the stone. Besides the player stones, there are four special stones in the pouch. Red means miss your turn. Black means take two turns. Green means you can slide any stone diagonally one space into an empty slot. White means you can take any stone off the board and replace it in the pouch. When you draw any of these special stones you complete the action and then return them to the pouch. The players score points whenever their stones form squares and play ends when all of the player stones are used and only the 4 special stones are left in the pouch. Like other abstract strategy games from Games Above Board, Mozaic relies on some very simple rules to create it's challenge. So, like the others, it's appropriate for young players but scales nicely to older players. A couple of caveats: first, of course it's an abstract strategy game, so you have to like this kind of game to get into it. 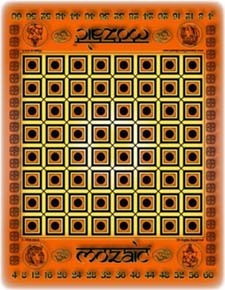 And Mozaic relies on the luck of the draw to create some of its excitement, so players who prefer strictly strategy might prefer other games, such as Hijara. A game of recreation using luck of the draw, tactics, placement, movement and point accumulation with a second tier that becomes apparent later in the game. A game of 1,000 steps begins and ends with just one gem... for two players and for all the ages. Perhaps the only game that allows players to place, move &/or remove the opponent's pieces as well as their own. Win or lose, it's in the bag! Played on a tiled game board with 1 emerald, 1 ruby, 1 diamond, 1 onyx, 33 cobalt & 33 amber gemstones. Velour bag supplied.